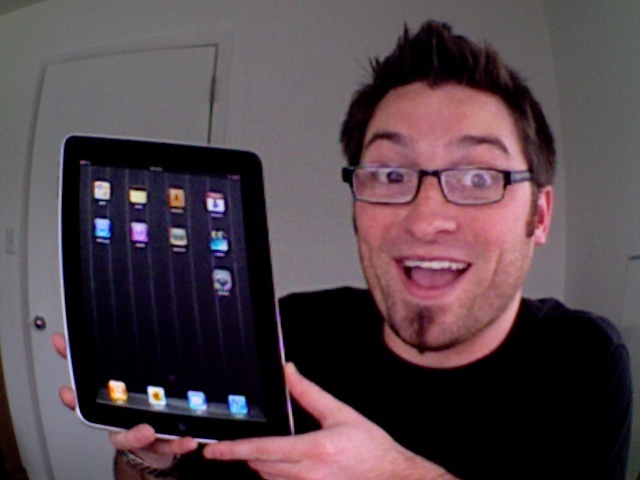 Since I LOVE technology so much, and I love Apple sooo much…I’m gonna join the other geeks out there and write up a quick post about the iPad! This will be the only one though (I don’t promise). Just to bring some up-to-date: I am a business educator at Wilmot Union High School. I am so lucky to work with such an awesome business & technology department that centers curriculum around preparing and educating our students for the 21st century and beyond. From SmartBoards to iPads, we do whatever we can to stay on the edge of technology by utilizing products that will help us as educators, help students learn, or both. On Saturday (4/3), I received an email from my department chair saying that our iPads have arrived at the school and somehow ended up in the Fitness Center. So I happily picked them up as soon as I could on a very happy Easter morning! I was not extremely excited when Steve Jobs first announced the iPad, mainly because it seemed to be a larger version of my iPhone. However, my first 10 minutes with the iPad had me a little surprised. The form factor and build is amazing. Apple never ceases to amaze me when it comes to the look, build, and feel of their products. The iPad is no different. The single most awesome thing about it…is it’s speed and response. Compared to my iPhone 3g, it’s way faster! When I flip the orientation, the screen adjusts way faster than the iPhone. The touch response is also way quicker and more accurate than the iPhone. I was using the Maps app to pinch to zoom and drag the satellite view all over the place. If you get a chance to play with one of these, you’ll notice a dramatic difference in speed and response compared to the iPhone. The selection of apps that come with the iPad is slim! I assumed there would be the alarm clock, calculator, weather, and stocks apps like the iPhone, but no. This was a little disappointing. The iPod has been incorporated in schools as a tool to engage students. The iPad will too. Not only does it do all of the same great things the iPod Touch can do, but it also provides a resource for new textbooks, or iBooks. I use a free app called Touch Mouse to turn my iPhone into a wireless mouse & keyboard for my computer connected to a SmartBoard. While my laptop sits at the back of the classroom and the SmartBoard at the front, I can be anywhere in the room to type and control the mouse. With this app on the iPad, it can easily be passed around among students to demonstrate and take control of whatever is on the SmartBoard without even leaving their seat! This cool device will be great for photographers too. I can see this being used to show photos and slideshows to clients. The clients can easily hold this in their hands and navigate through the photos on its beautiful screen while sitting at a table or on a comfy chair or sofa. It will also be a nice way for photographers to take their work on the go. Just take the iPad along and you’re ready to display your best albums anywhere you go. Here’s the thing… I live by my iPhone, and I am really looking forward to the next version. I will be saving my dollars to buy that next. Additionally, if you follow the rumors about the iPad or have experienced the brief history of the iPhone, we know there will be another version of the iPad out soon. When the iPad version 2 is released…I will probably have to get one! Previous post: It’s a happy Easter! I’m also a business education teacher and I’m trying to justify to my tech department why they should allow us to purchase iPad’s for teacher use. What types of things do you use this for in a business classroom? You can e-mail if it would work better for you. Thanks for your help!